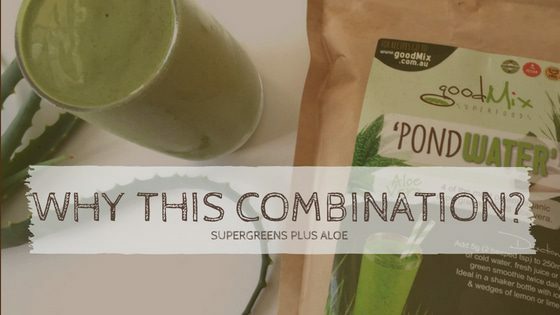 PondWater – Supergreens Plus Aloe. Why this combination? I could have made PondWater MUCH cheaper had I left the aloe vera out, or decreased the percentage used (it’s 8%, not just a teeny bit to make the ingredients list look good). I really wanted it included at a good therapeutic dose, because in the years I spent working in health stores & pharmacies I’d spoken to so many customers who swore by their aloe inner-leaf drinks, for numerous ailments – plus it has such a long history of helping with digestive issues. Thousands of years of anecdotal evidence beats the latest clinical trial any day in my book! I’ve always been a huge believer in treating the gut first & that all disease can be improved with some attention & TLC to the gut. So, aloe inner-leaf gel, as one of the most useful gut foods out there just had to go in, pricey or not! 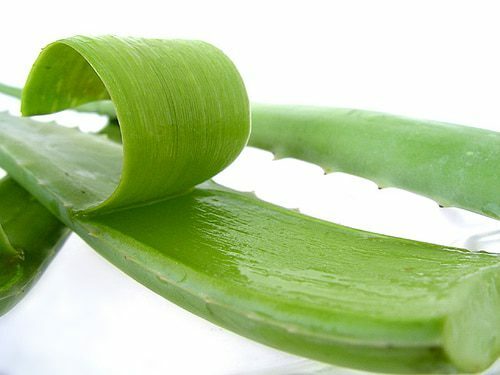 Imagine how many kgs of fresh aloe vera gel it takes to create just 1kg of pure dried powder, it’s a lot when you consider the high water content in the fresh plant, & that all the outer skins cannot be used. We had a lot of ‘gut people’ already using Blend11, so I thought aloe would be a perfect addition to supergreens to help support gut microbial balance, the gut lining, as well as the things we can all use help with – energy, immunity, inflammation, skin, liver & metabolism. As well as the long appreciated gut-soothing, prebiotic, anti-inflammatory & antimicrobial properties, there have been some very promising Aloe Vera trials showing improvements to blood glucose control, cholesterol & triglyceride levels, uric acid levels & many skin issues. Watch this space as more evidence comes to light, though for me it’s fairly obvious that a food / supplement / lifestyle change is doing good things when you can see positive changes in skin & an increase in energy (the 2 most common things people notice when using Pondy regularly). *Note that PondWater only contains pure inner-leaf aloe gel, no latex – so it comes minus the anthraquinones found in whole leaf aloe extract. Anthraquinone is the bitter constituent found in the green outer leaf & latex which has some really negative effects like gut irritation, potential liver toxicity, & it acts as a harsh stimulating laxative. Be careful when harvesting fresh aloe yourself that you don’t ingest the outer leaf or the yellow stuff just underneath. Anyone who’s worked in a health food store longer than a few years gets a sense for ‘supplements that are mostly hype & will enjoy huge popularity then pass, but there are some real ‘stayers’. Spirulina & Chlorella are 2 of them, consistently popular for decades because people actually do notice a difference when they use them, & even more so when they run out! These tiny greens have been used as food / medicine for hundreds of years, beginning back in the days when foods (rather than chemicals) were our go-to therapeutics! As well as being nutritional superstars with up to 70% protein, good fats, loads of vitamins, minerals, antioxidants, trace elements & fibre (phew), spirulina & chlorella (like aloe) are ‘selective’ prebiotics. They have antimicrobial properties as well as playing a prebiotic role, supporting some of our beneficial organisms while suppressing some of the nasties. The soluble fibre they contain is metabolised by gut microbes into the highly beneficial, anti-inflammatory short-chain fatty acids (SCFA’s). The algal supergreens are similar to & very complementary to the actions of aloe vera – research suggests that they are all great food supplements for helping normalise blood sugars, triglycerides & cholesterol. Perfect food-medicine for the average Joe & Jo-Anne, looking to lose a few kgs & get their diabetes & cardiovascular risk factors under control. Don’t worry – they’re guaranteed gluten-free! Our grasses are grown in Australia, specifically for the gluten-free market. They’re grown organically outdoors in soil & sunshine, then harvested & dried long before any grains have even developed, & batch-tested so we have no concerns with gluten contamination (as can happen with other grass powders). We have many gluten intolerant & coeliac customers doing really well on PondWater. Both grasses are highly nutritious (protein, vitamins, minerals, antioxidants, trace elements & fibre). Once again – grasses are fantastic microbiome food, offering selective prebiotic benefits along with polyphenols to support a healthy gut microbiome. And if anyone asks ‘what about the famous cardiologist Dr Gundry? He says grass is toxic to humans & it makes dogs throw up & we can’t digest it (viral Facebook video, eyeroll emoji)…well think about this. Humans can’t actually digest any fibre. Our microbes do that for us, fruit, veggies, nuts, seeds, beans, algaes, grasses – the fibre in all of them is food for our gut bugs to thrive on, not for us to digest personally, we can’t do it. And any vet (or anyone with a dog) will tell you that dogs often eat grass without vomiting afterwards, maybe they know it’s good for their gut bacteria? My bet is yes it is, the dog microbiome is really similar to ours. I’ve personally seen many people introduce a powdered grass supplement into their diet & feel much more energetic, notice changes in blood fats / sugars, skin improvements…maybe a side effect of the dreaded grass toxicity? I must be extremely unwell with all the grass I’ve consumed over the past 20 yrs, super greens are the one supplement I’ve included in my diet consistently since discovering them! And I’ve often shared with my canine buddies. I could have added a flavour, a sweetener, or some cheap fibres, protein powders, dried fruit & veggie powders…but I hate it when manufacturers add those ingredients into beautiful pure green powders! I much prefer to use fresh fruit & veg as natural flavours / sweeteners, & I’d rather eat my fruit & veggies & protein fresh – not quite as easy to get my fresh grass, algae & aloe in each day! So – the PondWater ingredients list is simple compared to many other green powders, just 5 ingredients. This was my intention to keep it really potent (from feedback it’s actually been so potent that we’ve decreased the initial suggested serving size on the packs). If your ‘greens powder’ has a massively long list of ingredients, you’ll likely be getting loads of cheap fillers & not many actual greens (one popular brand has 2g of greens per 12g dose), & none of the ingredients will be anywhere near a therapeutic dose (i.e. you won’t get enough of anything daily to really notice a difference). The name ‘PondWater’ just means that it won’t taste amazing, but at least you can take a green drink to work & declare that you’re ‘just having your daily PondWater’ to anyone who asks ‘what the hell are you drinking? ?’ with a disgusted look on their face!! 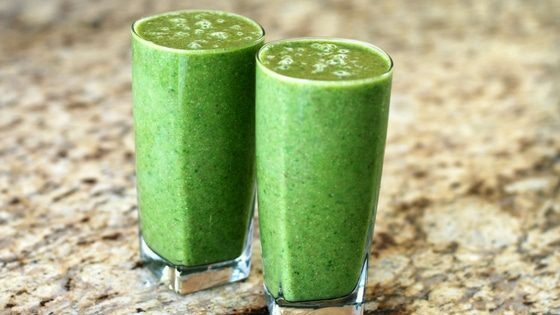 It really freaks the kids out too, which is fun – but they’ll love it in a green smoothie! The taste can easily be masked with fresh lemon or lime (throw a few wedges & the peel into your shaker bottle), or it goes great with any green smoothie (see recipes). The benefits are well worth getting used to it, I promise! For a freaky-looking skin treat, you can use PondWater (mixed with water & clay powder) as a before-bed face mask (be aware you’ll look a little pink afterwards, but your skin will look & feel amazing when you wake up!) *patch test is recommended for sensitive skin, just to be safe. Just leave it on until the clay dries out, then use warm water & a face cloth to remove (best done in the shower). How to: plus 7 essential skincare tips! 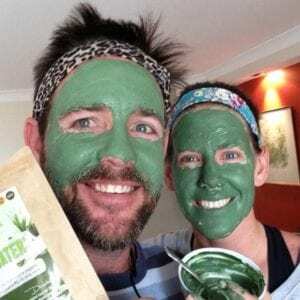 This entry was posted in Product info, Skin Health and tagged acne, aloe vera, barley grass, detox, green smoothies, pondwater, spelt grass, spirulina, supergreens. Fighting Depression & Anxiety With Food – Eat Yourself Happy!